The cassowary’s feathers are not designed for flight but for protection in its rain forest habitat, keeping the bird dry and safe from the sharp thorns found on many rain forest plants. Taking pictures of feathers was a dream assignment for photographer Robert Clark, who loves nature and finds beauty in birds. “It started as a magazine article,” he recalls. “We were lucky. We were working with some scientists. And we went to China, shot a lot of the fossil evidence of feathers, which takes us to the origin of feathers way back in time, to 160 million years old or so. We went to feather collections around the world. 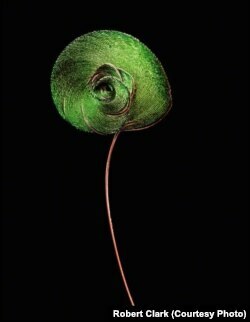 These photographic journeys took about a year and resulted in a new book, Feathers: Displays of Brilliant Plumage. 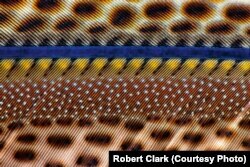 Along with dozens of bold, eye-popping images, Clark includes information that many people may not know about feathers, such as structural color. Portraits in the book — and they are portraits — illustrate the diversity in feathers’ shape and function. The southern cassowary, for example, can't fly, so its coarse, hairlike feathers serve mostly as insulation and protection. The lesser snow goose has two color phases: a dark (blue) plumage and a white (snow) plumage, so it is also known as the blue goose. That’s not the case for the lesser snow goose. Other birds’ feathers are designed to attract mates. “The great argus is a bird that is kind of drab in color, but then it lifts its wing up and there comes this multicolor pattern: blue, yellow and little speckles all over it,” he explains. Great argus males are unmistakable with their astoundingly long wing and tail feathers, decoratively adorned with a complex pattern of eye-spots. “Some of the biologists I’ve spoken with believe that the pattern replicates some of the seeds that the birds eat. So when you show a female, 'Hey, I have all these seeds,' they're attracted to a bird that has more food. So there are little things like this that you learn that makes feathers even more interesting,” Clark added. As a photographer, Clark says he followed a very direct approach in aiming his lens at the feathers. The male bird of paradise from Papua New Guinea uses its coiled tail feather in a complex mating ritual.